The latest estimates put their joint worth at more than $1billion. But it has emerged that Jay Z and Beyonce secured a massive mortgage in order to buy their new $88million 30,000-square-foot Bel Air abode. Public records show that the musical duo secured a home loan of $52.8million, the LA Times reported on Monday. 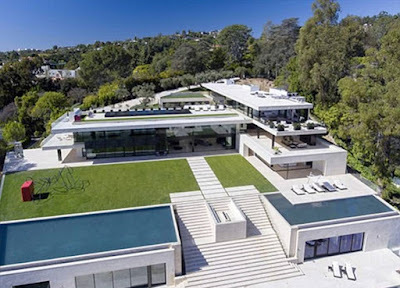 Their off-market purchase is the highest sale of 2017 in Los Angeles County, beating out music mogul David Geffen's $85 million deal for his Carbon Beach compound. Developed by Dean McKillen, the modern mansion sits on two acres of land high up in the hills with six different structures on the property. The over-the-top gated property features four outdoor swimming pools, a spa and wellness center. Amenities also include a media room, multiple outdoor entertaining areas, a full-sized basketball court and staff quarters. The luxurious compound is complete with a 15-car garage. Known as La Villa Contenta, the 13-bedroom home boasts roughly 16,000 square feet of living area, with a guest house, tennis court, pool, and nearly eight acres of prime ocean views.